We're not sure whether to call them "taptops" or "lablets," but Samsung unveiled two brand-new "Slate PCs" at Germany's IFA Consumer Electronics Show today. The catch? 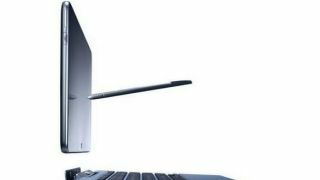 These devices straddle the line between a tablet and a laptop as a result of their most compelling feature: The ability to shift, Transformers-style, between a notebook and a tablet using a detachable keyboard. The Series 5 notebook will run between $649 and $749, depending on whether a potential purchasers opt for a keyboard dock or not. The Series 7 notebook floats in at a single price: $1,199. Both slate systems are expected to hit shelves on Oct. 26. Contrary to what you might expect at first, the major differences between the Series 5 and Series 7 slate systems are not necessarily their sizes. Both slate PCs rock an 11.6-inch touchscreen; the Series 5 runs a 1,366-by-768 pixel resolution, whereas the Series 7 jumps up to a full 1080p display, or 1920-by-1080 pixels. The systems differ in weight, but barely so: The Series 5 comes in at 1.65 pounds versus the Series 7's 1.89 pounds. It's as miniscule a difference as the systems' thicknesses, with the Series 7 commanding all of 0.12 additional inches of height versus the Series 5's 0.38-inch thick frame. Much more important than sizes and weights are the systems' guts, where the major differences between Samsung's slates emerge. Power-users are likely to be more interested in the Series 7, as it will sport a full-fledged Intel Atom Z2760 processor - a dual-core chip running at an undisclosed clock speed - in addition to four gigabytes of RAM and a full 128-gigabyte SSD drive. The Series 5 slate PC drops down to a dual-core Intel Core i5-3317U processor running at 1.7 GHz, and halves both the RAM and SSD storage to two gigabytes and 64 gigabytes respectively. The multi-touch display found on both systems attaches to the accompanying keyboard with mechanical hinges instead of magnets. According to Samsung, the purposeful switch is designed to ensure that the screens stay properly affixed to their keyboard partners. Both slate systems will also include an S-Pen for precision note-taking, sketching, and twirling around one's finger.